One of the very first questions we get when someone inquires about the Eco-Harvester is “does it really pull lake weeds by the roots”? This is a fair question since the Eco-Harvester is the only harvester in the world that actually pulls lake weeds instead of cutting them and therefore the skepticism is legitimate. You can read all of the information you want on our website and brochure, you can also watch any number of videos showcasing the Eco-Harvester’s capabilities but, until you see it with your own eyes, it can be a hard concept to grasp. We understand your concerns and skepticism, which is why we offer FREE product demonstrations because seeing is believing right? We have three demo sites throughout North America and we can typically set up a demonstration within days of contact. On the East-coast, you can visit an existing customer in either Connecticut or New Jersey for a free demonstration. If you are located in the Midwest, South, or West-Coast, you can come visit our Minneapolis, MN facility. We are set up for demos and are only 20-minutes door-to-door from the Minneapolis-St. Paul airport to our demo site. In almost every case, if you choose to fly to Minneapolis we can get you in and out the same day. Arrive in the AM, one of our representatives will pick you up at the airport, drive you to demo site, conduct demonstration during late morning/early afternoon, we’ll feed you lunch, and take you back to the airport in time to catch your return flight! As further incentive, we will reimburse you for your airfare expense (up to $500.00) provided that you end up purchasing one of our harvesters. 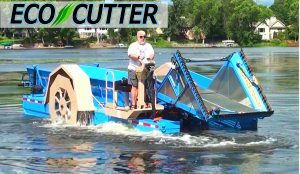 We are in peak harvesting season so the lake weeds are in full bloom and even if you are considering a purchase for 2019, now would be the time to see our Eco-Harvester and Eco-Cutter in all its glory. Even after seeing a product demonstration, we understand that you may want to speak with our existing clients to discuss, performance, customer satisfaction, and basically ask any question you need for peace-of-mind. Not a problem as the Eco-Harvester is in its seventh year of existence so we can put you in touch with as many existing Eco-Harvester references you need to feel good about your purchase. Lastly, please take the time to watch some new videos showcasing our Eco-Harvester including, operation, technical, and sales information that can only help you with your due-diligence as you evaluate which harvester is best-suited for your application. Please call toll-free @ 877-224-4899 to schedule your FREE harvester demonstration TODAY!